Ayurveda is the in-thing now! 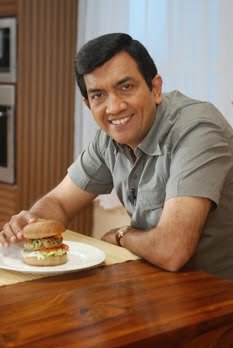 Wrapped up a successful schedule of Sanjeev Kapoor’s Kitchen day before yesterday. Must mention that this had been one of the best schedules till date, with loads of exciting themes and some enthusiastic fans calling up and talking to me! Kudos to my team, one more time, who put up a great show. The most interesting part was the Ayurveda special episodes. I am deeply attached to this subject as it is one of India’s gifts to the world, for a healthy living. So, what better could I possibly do, than to propagate the wonders of this marvel through my recipes. Ayurvedic cuisine is already making a mark on the world map. Hence, as a true Indian, it becomes my responsibility as well to promote it at its best. So, cooked up a few recipes like Amle ka Sherbet, Barley Khichdi, Lal Maath ki Sabzi, etc., to go with this theme. I also made it a point to talk about a few Ayurvedic herbs with actual illustrations during the course of the episodes, just to give all the viewers an idea about this precious genre of science. This is just the beginning and will definitely work on this subject more and more. I think introducing Ayurveda in today’s fast-paced and strenuous lives will not only reduce the lifestyle related diseases amongst people, but also get in some discipline, leading to overall mental peace. Also, latest is CNN International’s series ‘Fusion Journeys’ which begins its broadcast from April 23, 2012. In this there are 3 films of 5 minutes each of my journey to meet Chef Rene Redzepi of Noma fame in Copenhagen. These films will be broadcast during ‘Connect The World’ every Monday, Wednesday and Friday late in the night. Follow the link to get more of this: http://edition.cnn.com/SPECIALS/fusion-journeys/index.html. On the office front, today I will be busy with a shoot for People’s Magazine and my team has already started the work to help me dish out an exhilarating mango recipe. Thrilled! Also, Turban Tadka shoots are getting over today. This is it for now and I shall keep my fans and followers updated with more and more on the Ayurveda front as well as every other happening in general. Indian snack recipes are something always in high demand! Be it the universal samosa, or the pakoda, the idli or the dosa, snacks like these are mini meals when accompanied with the appropriate beverage, which in most homes would either be a cup of hot tea or cup of frothy coffee. Indian snack recipes are also the ones that have been the most experimented with! If you are not looking for the usual potato or keema stuffed samosa, look for a recipe like Mini Chinese Samosa which is not only a fusion of two cuisines but also fast becoming an added attraction in wedding buffets. Well , wedding buffets do take the cake when it comes to a glorious display of Indian snacks, served hot and live! You can settle at the dosa counter, or the chaat stall and then decide to give the heavy main courses a complete miss. Kala Chana Matka Chaat is something one could make at home and also use to grace the party tables. Kids simply love the Chinese dosa or the Spring Dosa, so make these a Sunday special. So travel the length and breadth of India browsing for Indian Snack recipes and you will surely include the Punjabi Samosa in your tasting, or the kachoris in Marwar, the Bhutte ke Khees in Indore, the appams in Kerala and the puchka in Bengal. And oh yes, the all time favourite of Mumbaikers, the vada pao. It comes across as the most popular street food and there is really no other contender which can comes close to this common man’s snack! Other popular ones are the Bhel puri, which can be altered to the Sprout Bhelpuri or something creative like the Bread Bhel Puri. While it is easy to digress from one mouth watering snack to another, let us now leave some space for the incoming greatness of non vegetarian Indian snack recipes…. CNN has done this programme beautifully portraying it as a chef’s journey to a location of his choice. I had an absolutely memorable time with Chef Rene Redzepi. He serves Nordic food at his world-renowed restaurant Noma and we had to go out of town to look for new ingredients, whether it was the seabed or riverbanks and forests. I was totally impressed by Chef Rene’s quest for perfect ingredients and his Smoked Quail’s Egg is something that I would love to introduce in my new restaurants. The soft boiled quail egg is smoked over hay, and is presented in a small egg shaped dish, served with a side of radish in edible “mud” ( it is created with roasted malt and hazelnut on herb cream). We exchanged many notes and I enjoyed teaching Chef Rene some of my dishes. Before I left he served me one if his three prized possessions – orange flavoured ants. These are local ants with a citric flavour and not normally put on his menu. To catch these incredible series that successfully illustrate cultural fusion, tune in to CNN international tonight. Loads happening in our kitchens with an absolutely new menu being evolved for The Yellow Chilli outlets. Trials of the recipes are happening, day in and out, and chefs are busy. My partner, Fudkor, who make Khazana Pickles held a puja at their new factory near Katraj in Pune today. My colleague Rajeev represented me on this auspicious occasion. All the very best to Mr Dipen and Mr Kapasi and Khazana Pickles! More people will be have access to these pickles now. Leaving for New Delhi tonight as I have a shoot at Noida tomorrow. Will be accommodating some media meets alongside. As there is abundance of summer gourds in the market, how about some tasty preparations using them? Just as I am about to board my flight for back home, I thought I would share pictures of the White House visit with you. Also giving you relevant links about the coverage. I will just about make it before midnight and celebrate my day with Alyona at home! Will cook a meal for the family at a later date! Soon after reaching there are plans for a shoot at Delhi and then I have to gear up for the shooting spell of Sanjeev Kapoor’s Kitchen. I am sure you will be intrigued to see the inside of the White House. Well, I am sharing all that I had access to and I spent some really memorable few hours. Helping the White House kitchen roll out Easter eggs and other goodies was my dear friend from Mumbai Chef Anil Rohira. He makes all of us proud of his achievements. I felt good to be in the White House and also spend so much one-to-one time with Executive Chef Bill Yosses. His parting gift to me was a warm hug and wishes to see one another again, probably in India. He has accepted my invitation to visit India! He showed great interest in my book How to Cook Indian and he also mentioned that he loves to eat at Indique Heights, my friend Chef Vinod’s restaurant. I feel thrilled that Indian cuisine is being explored at such exalted levels now. Will write again when back home. EASTER AT THE WHITE HOUSE! The Varli Food Festival went extremely well with all the love and support we got from Varli and Rick and the people here in New York City. And to add to it, a cherry to the icing – I had an amazing visit to the White House alongwith dear friend Chef K N Vinod and met another gem of a person with whom I work very closely in Mumbai Chef Anil Rohira there on Easter day. The ambience was all festive and a lot is expected to happen today as well because of the traditional Easter egg roll hunt where a whopping 30,000 visitors are already expected. Executive Chef Bill Yosses of the White House fame took us around and shared behind the scene preparations for Easter. 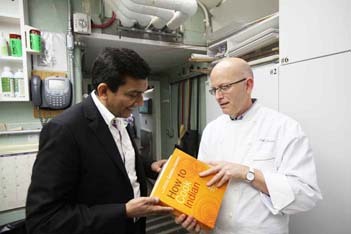 Chef Yosses being fond of Indian food discussed at length its growing popularity in United States and at the White House. He loves to visit Indique Heights, Chef Vinod’s restaurant. Also, a moment of pride for me was to present my latest book on Indian food, How To Cook Indian to Chef Yosses as also for President Obama and his better half, the First Lady. We also visited the First Lady’s favorite place in the house, her kitchen garden. It was exhilarating for me to get this opportunity to make it to the White House. Also, I have extended an invitation to Chef Yosses to visit India for a culinary tour. And by the way, the White House kitchen makes meals for around 4000 people everyday and the size of the kitchen is not as big as I expected it to be and this I guess could be a challenge for any chef. As I prepare for my journey back, let me share some local recipes from this part of the world. A day prior to the Varli Food Festival in New York, my second year of participation after the successful first year, where I’ll be carrying out a cooking station… It is the incessant love and passion of Varli and Rick, the energetic couple behind this successful concept which has brought me again to this festival. In some way I feel responsible that their efforts, in working towards making Indian cuisine amongst the most popular type of cuisines in America, should fructify and I am sure and confident they will. Also, New York is a city with a great open mind, where Indians abide in great numbers. Hence, the exposure to Indian cuisine to the locals of the city is substantially magnified by the Varli Food Festival. It is a wonderful platform to showcase Indian chefs and their creations. Besides this, I’m looking forward to introduce to United States my new Television Channel, FoodFood and this time around I am not alone, along with me are two Chefs – Saransh Goila, the winner of FoodFood Maha Challenge and Chef Harpal Singh Sokhi, the host of the popular show Turban Tadka. Amidst all this, I will be travelling to Dubai a couple of times to fine tune the launch of Signature, where trials are already happening. Also, just in from the channel side, FoodFood live shows are doing very well…a real motivation!!! Then, early May, more of travelling with a trip to Korea for WACS (World Association of Chefs Societies) where I’ll have to prepare a presentation as a keynote speaker. A lot more to follow as the days pass by.